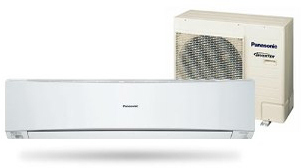 Choose a Panasonic 9.0kW ECONAVI Reverse Cycle Inverter air conditioner to stay cool during summer and warm during winter – now featuring a new stylish design and the ultimate in energy saving. ECONAVI is a Panasonic initiative which continues our core belief that going green shouldn’t compromise your comfortable lifestyle. By applying high-precision sensors and control program technologies, ECONAVI isable to optimise your air conditioner operation according to room conditions. This smart technology allows your air conditioner to evaluate the number of people in a room, along with their level of activity and adjust the airflow accordingly. This enables up to an additional 30% energy savings in cooling and up to 40% energy savings in heating, compared to other invertermodels. Not only does this reduce the wastage of natural resources, it will also save you money on your power bill. Panasonic’s unique Advanced Plus E-ion air purifying system is designed to detect and eliminate contaminants in your home. The system operates all year round, even when the air conditioner is in standby. If airborne dust or dirt is detected, active e-ions are released to collect and deactivate unwanted airborne particles. Combined with the e-ion filter inside the unit, the built in air purifier means cleaner, healthier air for you and your family, all year round. Now featuring an outstanding operating temperature range, heating operation is possible even when it’s a freezing -15C outside, so even the coldest parts of New Zealand are covered. The cooling operation is designed to operate even if it is a scorching 46C outside, which is perfect for New Zealand’s hot summer days. The outdoor units of Panasonic Air Conditioners are also protected from the damaging effects of salty air, wind and dust, thanks to the Blue Fin Condenser. This is a special antirust coating that actually triples the life of the condenser and lets you enjoy more years of reliable comfort. Indoor unit noise is as low as 21dB on some models, which is quieter than a typical library. This means the units are perfectly suited for bedroom installation, as they can be left running all night, without interrupting your sleep. Outdoor unit noise levels are also amongst the quietest in the industry, so you don’t need to worry about bothering your neighbours throughout the hot summer. This is the maximum energy saving value, and the effect differs according to conditions in installation and usage. Vertical Airflow direction: Auto, horizontal Airflow direction: ECONAVI Mode. Setting temperature goes down 2°C controlled by ECONAVI activity level. © 2019 - Set Point Technology. All Rights Reserved.